We’ve heard the claim, “Content is king,” and we couldn’t agree more. In the digital age, content is what drives engagement, loyalty, and attraction to a small business. Distributing content across social media channels channels is the fastest way to share with a broad audience in real-time. For small businesses, though, producing original and exciting content can be a challenge. Without large marketing budgets like big businesses, where do they begin? Well, the good news is that there are plenty of ways to create stimulating content that are right under your nose. Today, we’ll discuss eight ways to generate content that is perfect for small business social media. Let’s dive in! People love information, especially if it’s useful and free. Post best practices or professional tips to your social accounts to keep your audience coming back for more. If you post relevant tricks, it establishes your business as reputable and as an industry authority. Brevity is key, so make the content short and engaging with a related image or graphic that complements the tip. Social media is a great place to solicit opinions. Pose questions to your followers. What do they like most about your product? What do they want more of? You can even poll them for which of two services would they be more likely to buy. People are more than happy to provide opinions if asked. It gives them a sense of being valued, while supplying your business with critical customer data. Make sure you follow up your questions with actions taken, new products launched as a result of the user data. Again, it helps foster a positive customer experience and continues an organic dialogue with your followers and potential customers. People LOVE a good quote or inspirational message. 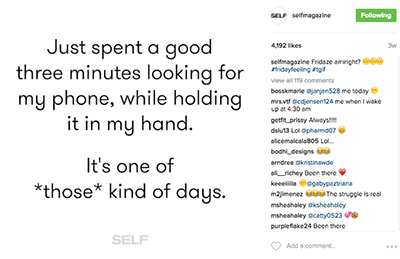 While scrolling through their social feeds, inspiring quotes give people a little boost and improve their moods. Quotes can also be funny and provide unexpected humor in a person’s day. While you can easily think of a few social posts that made you smile or bolstered your spirits, knowing which types of quotes and messages resonate with your audience is key. Your quotes should be applicable to your followers, and relate back to the underlying vision and mission of your business. 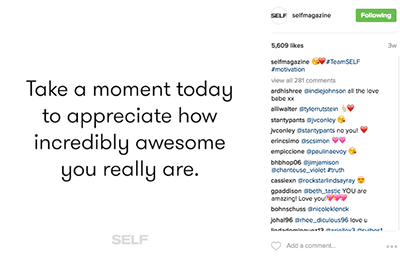 SELF magazine does a tremendous job if integrating these kinds of messages into its Instagram marketing. 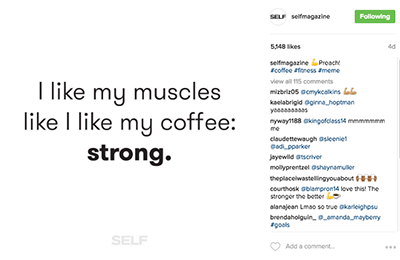 As a fitness magazine for women, every three posts are quotes that relate to being a strong woman, pushing through your limits, or a funny quip about exercise or food. These hit the mark with their audience and have built a loyal and robust group of followers. 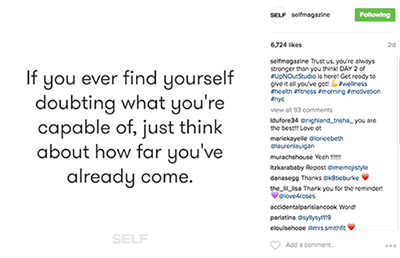 Take these examples and see how you can build quotes and inspirational messages into your social media strategy. You’ll find endless opportunities to put a smile on your followers’ faces and create addictive content. If your social media feels more like a rotation of dry information than innovative, intriguing posts, tap into trending topics or relevant industry news. Post an article your audience will find useful or intriguing. Include a trending hashtag on your posts and ask your users to post with said hashtag. Partaking in topical discussions brings a human element to your social media and breaks up the normal flow of content. It makes your social media feel like a conversation rather than a catalogue of content. Be mindful of which topics you decide to discuss. Politics, religion, and other sensitive topics should be left for your personal accounts as you never know what kind of responses you’ll receive. An amazing part of social media is how easily good information can be shared. Do you have favorite blogs or publications you read regularly? Share those resources with your audience. Sharing is caring, and your followers will love knowing which outlets you value and visit regularly. Additionally, they’ll appreciate your willingness to give them even more information without asking anything of them. 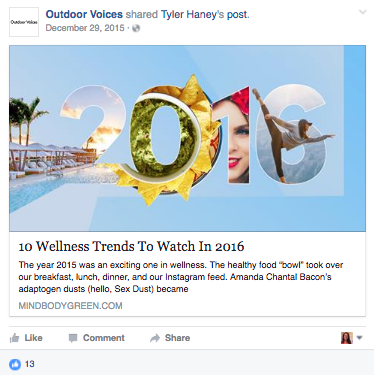 Outdoor Voices, an innovative fitness wear company, frequently shares other people’s and business’s articles to its Facebook audience. This simple trick provides you with unlimited content possibilities without having to actually create new content yourself. That’s a win in our book! There’s nothing better than giving a behind the scenes tour to your audience. Is your office participating in a community service day? Are you about to launch a new product? Record short videos to post on social. These teasers give your audience a sense of your business and that they’re being exposed to exclusive content. Make the videos fun and lighthearted, so it keeps viewer’s attention, but ensure it has a purpose and isn’t devoid of value. This should come as no surprise, but your followers want to see what your business has to offer. Showcase your products and services on your social media accounts. Create a branded aesthetic, with a specific filter, font style, or image, that makes these posts instantly recognizable. Of course you need to balance your product posts with other content. Your product posts should remind viewers of the problem your business solves and encourage them to click your website or make a purchase. Your offerings are the backbone of your business, so ensure they get equitable time on social media. Don’t you just love your customers? Do they often tweet about and mention you on social media? If the answer to these questions is “yes,” then it’s time to show your customers some love. Feature your customer’s posts on your social accounts and tag them accordingly. Doing so has major benefits for your brand. First, it indicates that someone is actually monitoring your accounts and it isn’t completely automated. Second, it is a direct way to thank your followers for the goodwill and broadcast it to your entire network. This sort of behavior reflects the human and appreciative side of a business. Lastly, a non-biased opinion from another user goes much further in gaining credibility with new followers. It is a resounding mark of satisfaction and is an authentic endorsement for your business. Pepper in positive posts from your fans a few times a week to gain brand awareness from your audience and accrue new followers. You’ll be surprised by how many new tweets and mentions your business starts to receive. Now your small business is equipped to build out a robust social media campaign. From these eight simple steps, your business is destined for improved social media ROI, greater website traffic, and customer conversions. Give them a try today!